Racing products that actually make a difference. Different horsepower ranges, different track sizes, different setups, different driving styles all require personalized setups. Adjusting torque arm length directly determines how much rear loading the car gets and allows you to tune the arm specifically for your race car needs. Our torque arm height can be adjusted up or down to fit your chassis center section height and interior. You can also run one bushing on the deaccel side instead of two and cut down the bottom female rod end to pick up more clearance as needed. By mounting the torque arm to the rear end through a pair of heim joints, our torque arm works with pinion angles from 0° to 6°. Heim joint mounting to the rear end also allows the torque arm to work with nearly any amount of active rear steer. Rear end misalignment is taken up through the heim joints keeping the torque arm free of side loading and allowing free vertical motion. Currently fitted for both 10" quick change and Ford 9" rear ends. All of our torque arm kits comes included with mounting brackets for 10" quick change rear ends. The Ford 9" adapter plates weld to the front face and bottom edge of the Ford 9" housing and have included bolt pattern for our quick change plates. If you ever update to a quick change rear end in the future, you still have all the parts needs to simply swap rear ends without changing mounting length or needing to purchase additional parts. Our torque arm is 100% steel construction to ensure long lasting performance and adherence with steel suspension rules. Our front armature design includes a female rod end for mounting to chassis as well as a spherical bearing inside the armature to allow full range of motion of the rear end and chassis.  A threaded rod run through the bushings and allows you to preload the bushing stack while the slider sleeve fits tightly over the threaded rod and allows the arm to travel freely minimizing wear on the bushings and the bearing.